It’s easy to judge a restaurant, like a book, by its cover. A restaurant in a strip mall, in a questionable part of town, makes you think the food can’t possibly be any good, right? The same occurs on the opposite end of the spectrum. A chain restaurant, with a glitzy exterior, in a high rent area, evokes images of an overpriced cookie cutter experience for me. Sure, the food is good, but is it memorable and worth the price tag? You’ve seen one $50 steak with a huge la carte side of mashed potatoes and you’ve seen them all, right? I have high expectations of these restaurants, especially when paying top dollar. Most of you probably do to. Well, I am not ashamed to admit that I was proven wrong, and reminded once again to never judge a book – or restaurant – by its cover at Eddie V’s Orlando. 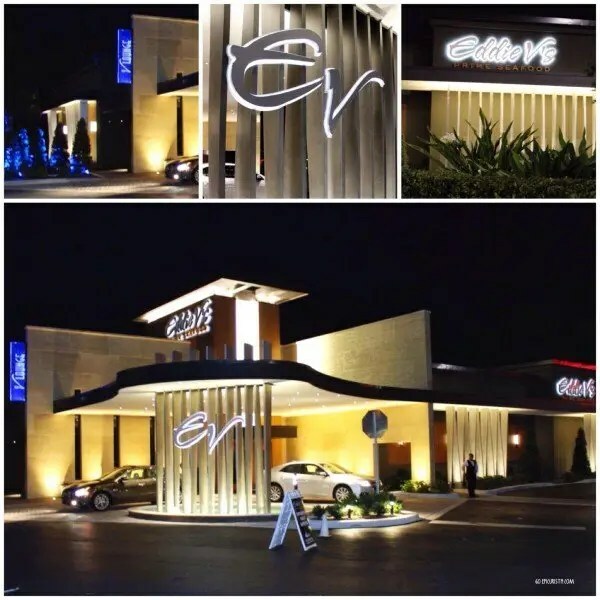 Eddie V’s Orlando exterior catches your eye like a glitzy South Beach Art-Deco landmark from the 1950’s, with expensive cars coming and going from the complimentary valet parking area. If the outside feels like you’re entering a glamorous movie set, the inside is all comfortable elegance, capitalizing on the beautiful lake view. I always thought the previous tenant, Timpanos, didn’t properly use this feature and was happy to be seated by a window, although there is not a bad seat in the house. Don’t you love dinner with a view? Randy Cook, Eddie V’s Orlando Managing Partner, graciously gave us a tour of the restaurant. As an event planner, I was impressed with the use of space, layout and the different private and semi-private areas for group gatherings, appointed with AV equipment. Eddie V’s Orlando is a great place for any special occasion, convention group or business dinner, where the goal is to impress from beginning to end. 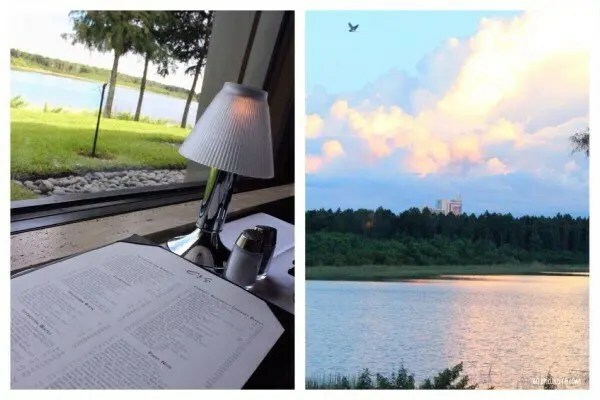 The menu offers a variety of appetizers, chilled oysters and shell-fish from the raw bar, salads and main courses with an emphasis on seafood, flown in fresh daily. Eddie V’s is definitely a seafood-lovers paradise. Carnivores also have plenty to enjoy. Beef selections are what you expect of a steakhouse menu, however, cuts are all USDA prime, which is top of the line. Where the chef surprised me and made this meal memorable was in the flavor profiles, blending touches of Asian and Latin cuisine to brighten up what would otherwise be just simply a good steakhouse. 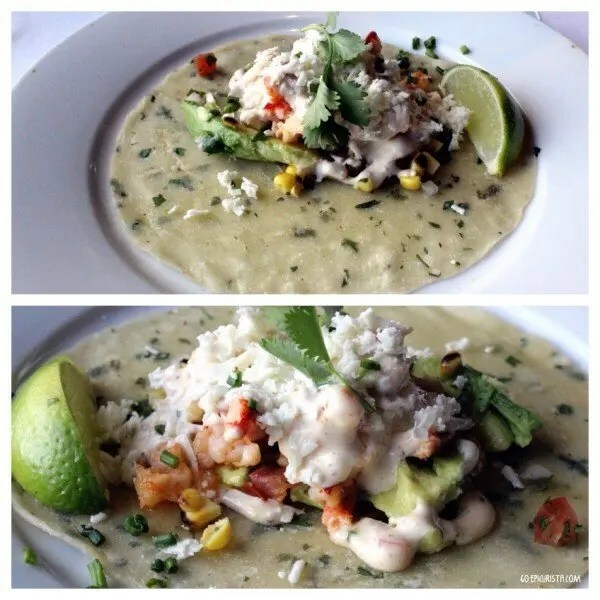 Lobster Tacos ($18), two per order, with fresh hand-made tortilla, similar to a crepe in texture, with large chunks of lobster claw meat, a refreshing creamy cilantro sauce and grilled sweet corn pico. This plate could have easily been my entree and I loved every bite of it! 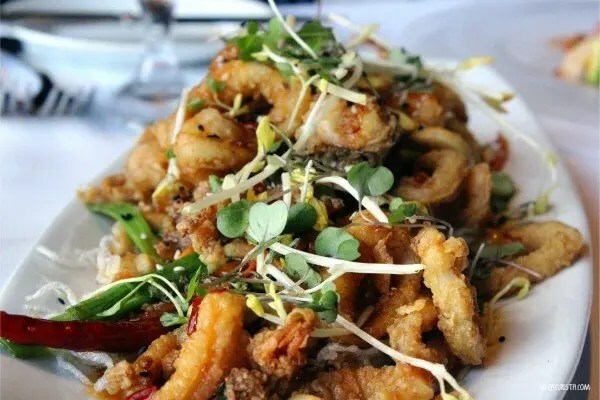 Point Judith Calamari ($15), kung pao style, crisp and tender with a bit of heat from the sauce and the chili peppers. 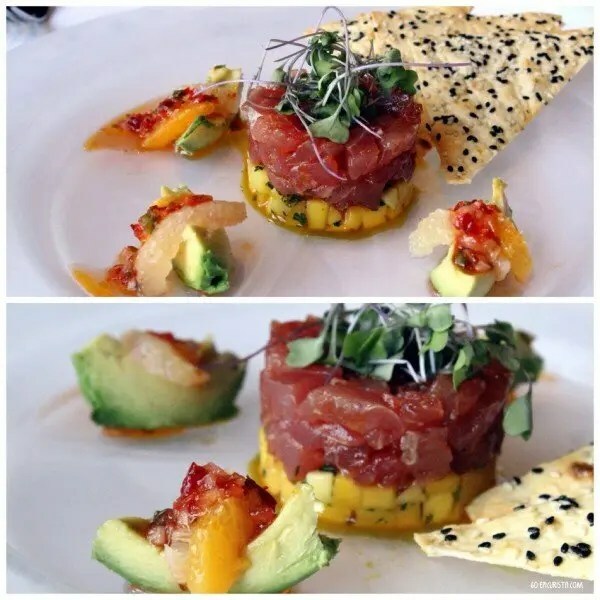 My favorite, Tartare of Pacific Ahi Tuna ($14), a gorgeous and colorful blend of sweet and spicy flavors from the sriracha oil, sweet mango, tart grapefruit and creamy avocado. 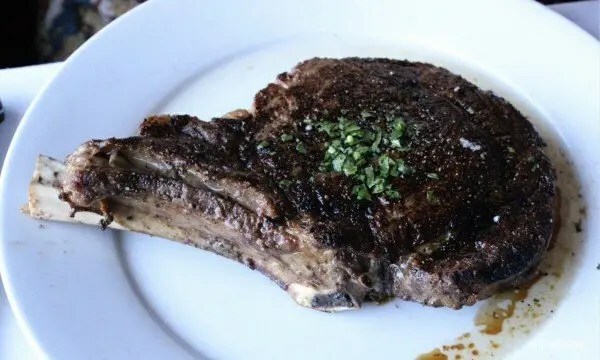 For our entrees, we followed our server’s recommendations and ordered a 22oz USDA Prime Bone-In Ribeye ($48), nice charred crust on the outside and cooked medium rare juicy on the inside. This is the Flintstones type steak beef enthusiasts dream of. Oscar style 8 oz Filet Mignon ($49) was perfectly cooked and so tender. Topped with a generous portion of fresh crab, over asparagus and Hollandaise sauce, which provided a touch of richness. 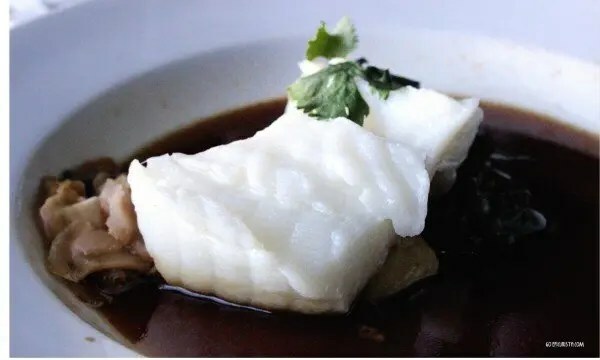 Chilean Sea Bass (mkt), steamed Hong Kong style, was silky smooth with firm flesh bathed in a light soy broth had a perfect infusion of umami flavors which keep you coming back for more. The dish was so fragrant, I had to stop myself from sneaking another bite from my friend’s plate. Flavorful sides, served a la carte, in small ($6) and large ($9) portions. 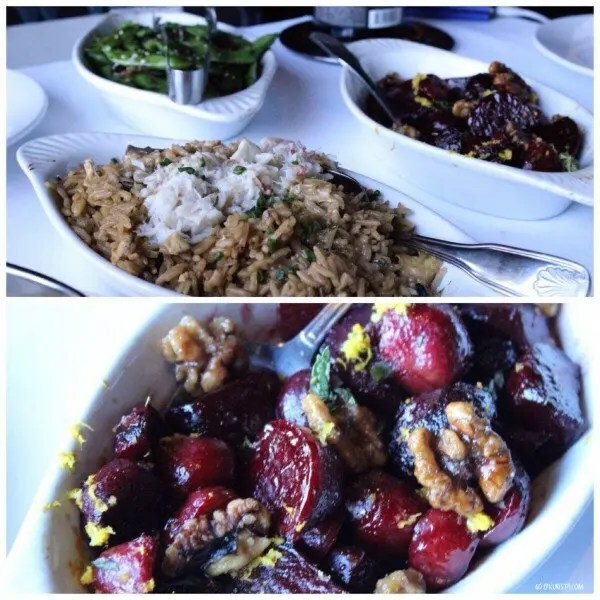 Crab Fried Rice with scallions and mushrooms, absolutely delicious and an unexpected choice and Roasted Baby Beets with Candied Walnuts and Orange zest, were definitely a treat. Truffled Macaroni and Cheese with 3 cheese Béchamel sauce was a must in a large portion as we all wanted seconds. 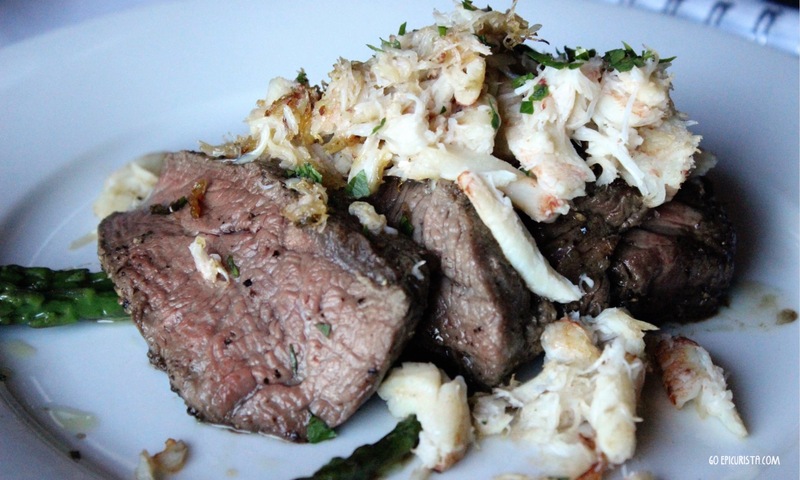 The panko bread crumbs and hint of truffles put me over the top. 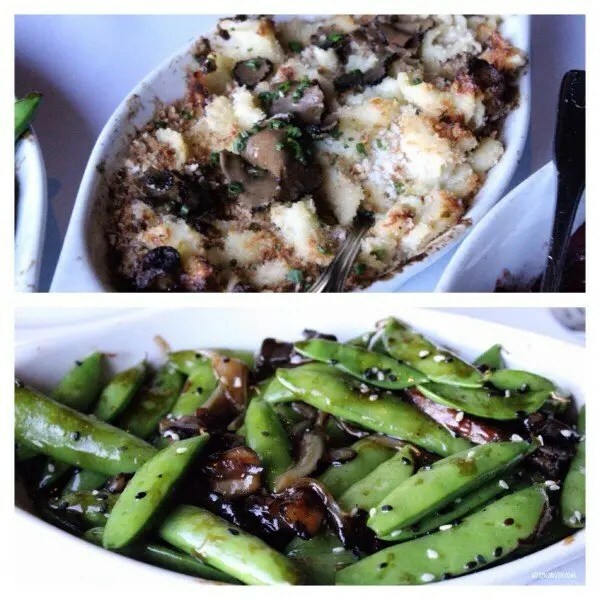 Sugar Snaps with Portobellos, were perfectly crisp with a hint of Asian flavors from the oyster sauce. Other popular choices we didn’t get to try are the Brussels sprouts with bacon and shallots and Au Gratin Potatoes. For dessert, we shared Godiva Chocolate Cake with a perfectly gooey lava style center accompanied by vanilla ice cream made locally by Amuse Gelato, and their most popular dessert, Bananas Foster butter cake with pecan ice cream and rum crème Anglaise, was a show-stopper flambeed at the table. 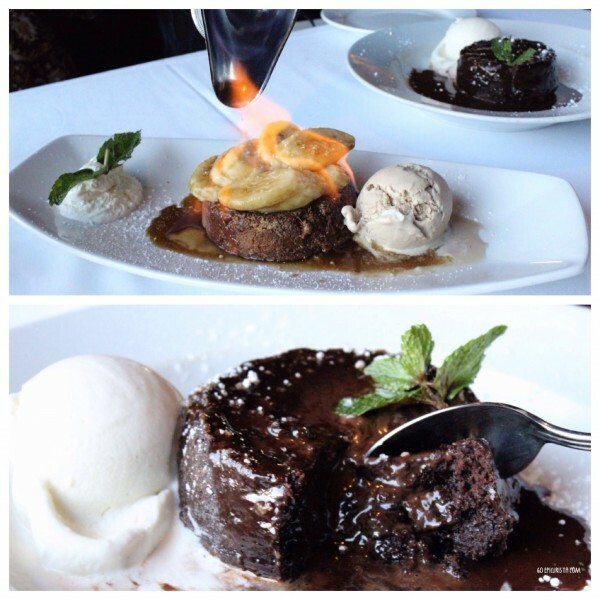 You must save room for dessert at Eddie V’s Orlando. The wine list, created by local Master Sommelier George Miliotes, offers a nice selection to complement the menu, reasonably priced, especially considering the establishment. 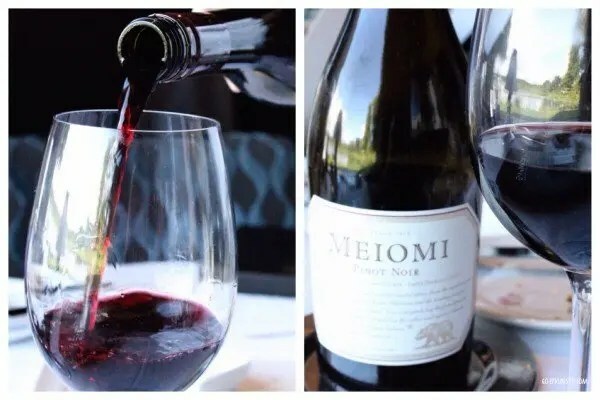 We shared a bottle of Belle Glos Meiomi Pinot Noir from Sonoma, California ($55) which is one of my go-to wines, as it pairs nicely with flavorful seafood and beef dishes. They also offer great choices in large format bottles for those special gatherings. Service was impeccable throughout and it is obvious they are well-trained in the art of fine dining. Water glasses remained full, table was crumbed, and courses were well paced. They were attentive and ever-present, when needed, without being intrusive. We were perfectly stuffed and impressed at the conclusion of our meal. To say Eddie V’s Orlando surprised me is an understatement. I expected it to be good, I did not expect it to be this memorable. 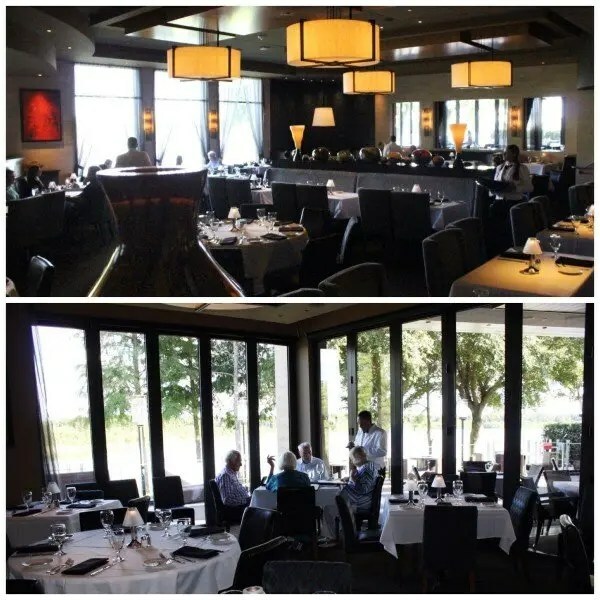 I found the overall experience to be several steps above sister restaurant and powerhouse, Capital Grille (both owned by Darden), as well as the other chain steakhouses in the area, in terms of creativity, flavor diversity, and ambiance. A meal here is pricey, yet not overpriced. 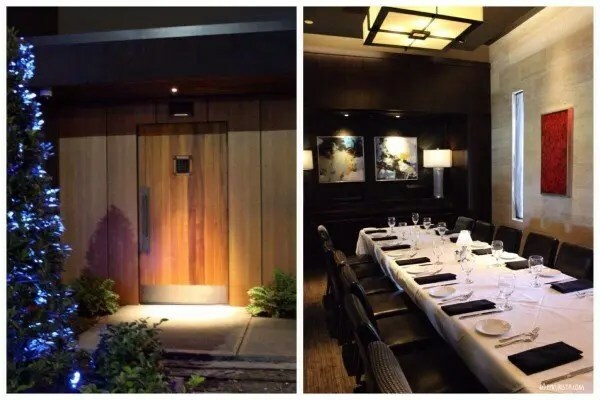 Definitely a place for any special occasion or business dinner, where the goal is to impress from beginning to end. If you want a coveted table by the windows, make an early dinner reservation. 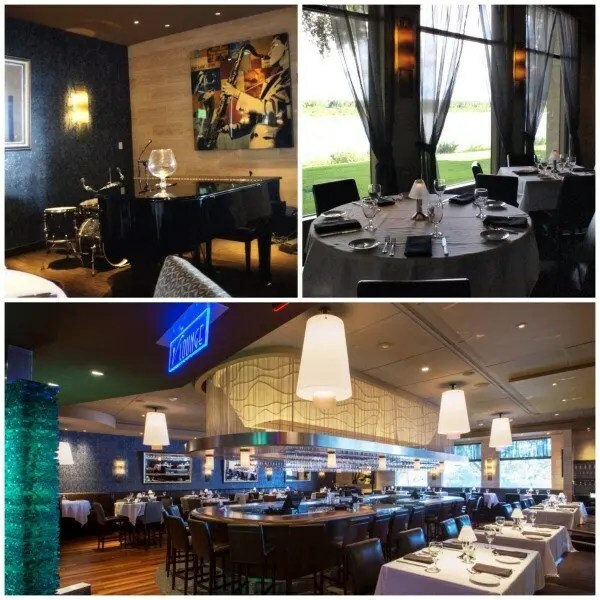 The V Lounge offers a more casual spot to have drinks and appetizers as well as full dinner, and the live jazz provides for a special backdrop. The lesson here is don’t judge a book – or a restaurant –by its cover. Go inside and check it out! Even a chain restaurant in Orlando can provide a memorable dining experience, and be worth every penny. Disclosure: On this evening, I was a guest of Eddie V’s Orlando media dinner. No other form of compensation was received. As always, all opinions are my own and I only write about and share food and wine experiences worth celebrating. Eddie V’s Orlando is located on Orlando’s famed Restaurant Row, 7488 W Sand Lake Road, Orlando FL. 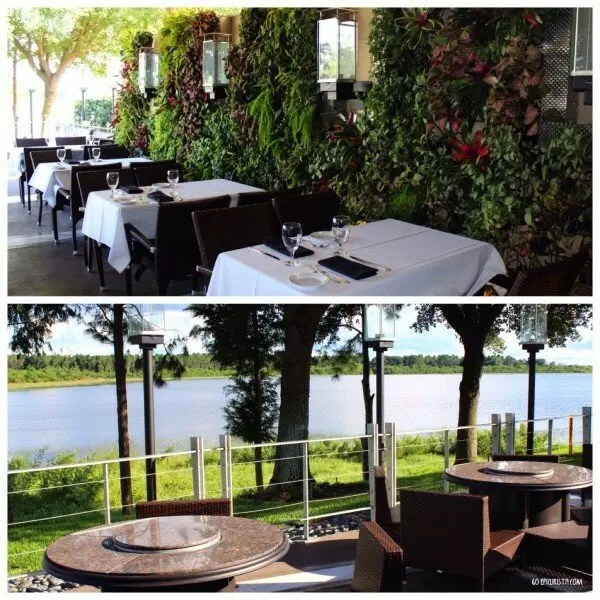 Reservations recommended by calling 407-355-3011 or via OpenTable.com. Have you judged a restaurant by its cover and been surprised? I would love to hear about it. Please share in the comments below. We got a group of friends together to try Eddie V’s during magical dining month and we loved it so much that we decided to take my mom back for her birthday! Your review is spot on for this upscale restaurant! Magical Dining at Eddie V’s was the best deal in town! So happy to hear you had a great time. Cheers to you for getting out there and celebrating life with friends and family!